Can you hear a faint *scrrtch* sound? No? Listen a little closer. There you go. You know what that is? It’s the sound of journalists scraping the barrel for news stories from the big Vanity Fair Star Wars: The Last Jedi preview. 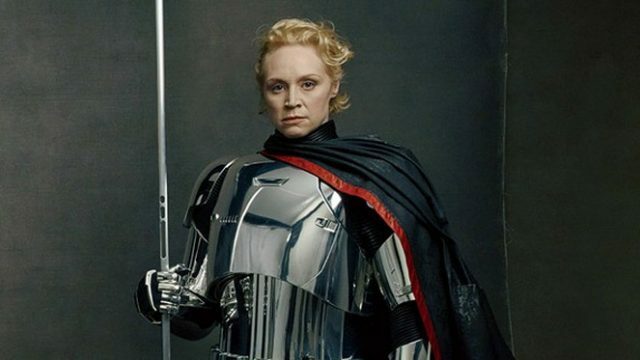 The latest tidbit comes with Captain Phasma’s appearance in the villains photograph from the article, in which we finally get a good look at Gwendoline Christie sans mask. Much hyped prior to The Force Awakens, those expecting a kickass Boba Fett style badass were left disappointed when she only appeared for a couple of minutes before being unceremoniously shoved down a sewage pipe and forgotten about. Actually, now that I write it out like that, she is quite similar to Boba Fett after all. But now she’s back, and Phasma looks precisely as pissed off as someone dumped into human waste and subsequently exploded should be. She’s also holding an interesting new stick based weapon. Fans were obviously eager to know what this is and asked Lucasfilm Story Group expert Pablo Hidalgo, who responded that it “doesn’t have a fancy name yet.” He also revealed that the weapon is more ‘lo-fi’ than you’d expect from Star Wars. So, it’s a stick, essentially. But a character as rich and deep as Captain Phasma can’t be armed with just a bog standard stick, right? Let’s brainstorm for a second, then. I’m going to call it a K’Jar Cortosis Mesh staff – designed specially to block and short circuit any lightsaber unlucky enough to tangle with it. With the Jedi momentarily confused by their non-functional weapon, Phasma strikes, brutally dispatching them to Force ghostdom. Sounds plausible, right? Hey, at least we tried. You can see Captain Phasma wielding her iconic K’Jar Cortosis Mesh Staff in Star Wars: The Last Jedi on December 15th.